13 Spence Street, near the corner of Abbott Street. 190 sqm first floor office available facing Spence Street. Near prominent retailers, corporate offices and tourism users. The office suite is individually air conditioned, has excellent natural light, suspended ceiling, lights and carpeted floor. It comprises a reception, four partitioned offices, a larger open work area, kitchen and male and female toilets. 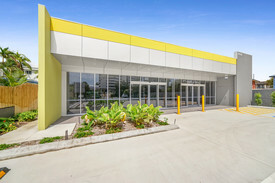 Currently leased on a monthly basis, ideal for owner/occupier or as an investment. Priced to sell at $500,000 (plus GST if applicable).